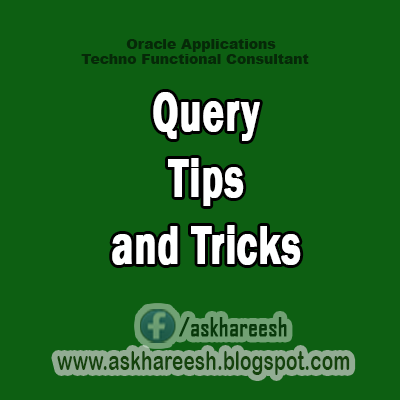 Most of our technical consultants used to write query fastly to find out number of records in a table, and find out the number of records between. here are some tips to find out from the front end itself. Query Wild Card Characters using "%" and "_". Now we will see the difference between this. After you execute the query. Now you want to find out the number of records in the last query. First press F11 in sales order screen then enter this in sales order number field #between 10 and 20. execute using CONTROL + F11, It will return the sales order number between 10 to 20. Now press F12, this will return number of records parsed now. You gave some input and query the records in the form. Now you want to find out, which query executed to get this details.